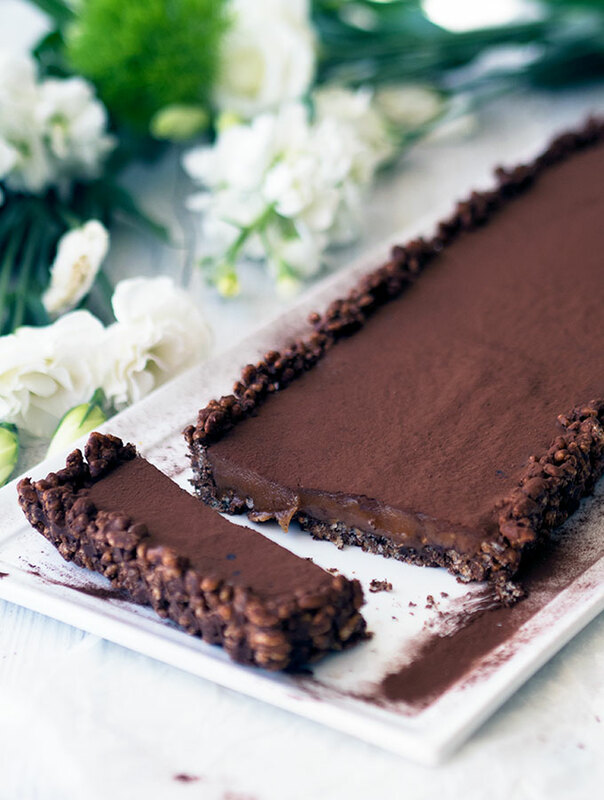 Home » Caramel Chocolate Crackle Tart, It’s a Cracker! Caramel Chocolate Crackle Tart, is for those adults that reminisce about their childhood party favourite chocolate crackles. Upmarket chocolate crackle shell filled with creamy dreamy caramel. One of my favourite party foods as a child was chocolate crackles. They are a staple of growing up in Australia. Rolled out at most birthday parties with jelly orange slices, fairy bread, party pies and sausage rolls. At least that was the party food of my childhood. These days you are more likely to see hipster kids eating kale chips out of mason jars, washed down with kombucha. As much as I loved chocolate crackles, just like playing bull rush, getting up at 6am to watch Saturday morning cartoons and slumber parties, I grew out of them. I find that my adult tastebuds just don’t find the copious amount of copha mixed with cocoa powder that appealing anymore. What I still find appealing about traditional chocolate crackles are the crunch of rice bubbles (rice crispies) and the use of desiccated coconut. This got me thinking. How could I “adult” a chocolate crackle recipe? Make a child’s party favourite into something I would be happy to serve at the end of a dinner party. I then started to think about one of my favourite sweet treats as an adult, caramel. Not dulce de leche or other types of caramel made from sweetened condensed milk. Don’t get me wrong they have their place. I’m talking about glorious French style caramel. The simplistic concoction of sugar, butter and cream. That when treated nicely and heated to the right temperature becomes a smooth caramel you can eat by the spoonful. These two elements are what eventually morphed into my Caramel Chocolate Crackle Tart. The chocolate crackle element had a make over by reducing the copha. I add just enough so the tart shell holds together at room temperature. Left out in summer it will still end up and chocolate crackle puddle. Cocoa powder only makes an appearance to dust the finished dessert, instead I use dark chocolate. Of course the rice bubbles and coconut stayed. My first attempt at this recipe was a delicious disaster. Actually not an entire disaster, I ended up with hard caramel. This resulted in my cutting the very solid “tart” into bite size pieces, which resulted in a hard caramel chocolate crackle candies. Not a loss at all, we managed to munch through all of the “disaster”. If you are a fan of chocolate crackles and caramel, I’m pretty sure you will be a fan of my caramel chocolate crackle tart. 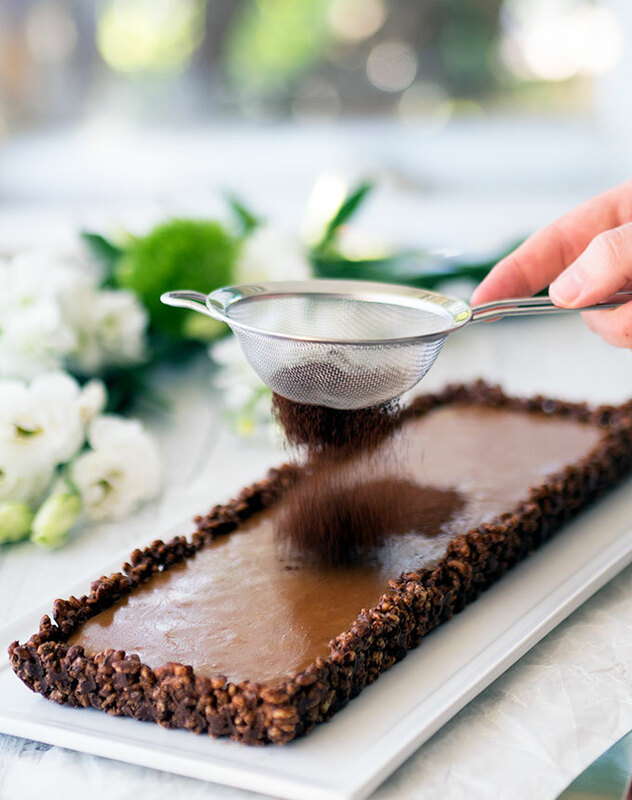 Caramel Chocolate Crackle Tart Recipe: Childhood party favourite is given a dose of adulthood with the addition of rich French Caramel to create the most decadent dessert. Line the base of a 12 x 36cm (5 x 14 inch) loose base rectangular tart tin with baking paper. Spray the sides and base lightly with coconut oil spray, melted coconut oil. Melt chocolate and copha in a large microwave safe bowl. When melting chocolate in the microwave do so in gradual steps mixing well in between to prevent burning the chocolate. You may have more mixture than is needed. Any excess mixture should be chilled in the fridge for chocolate crackle treats. 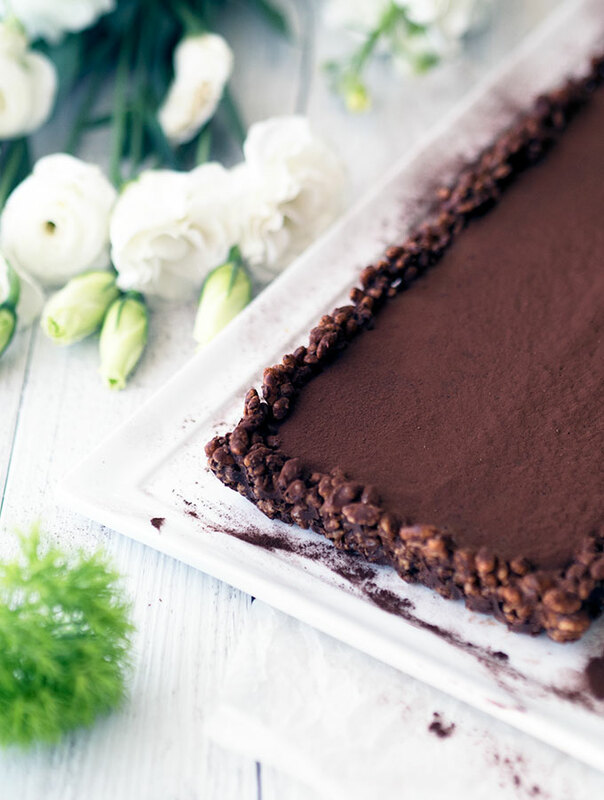 Place the chocolate crackle tart case in the fridge to set while making the caramel. In a medium size saucepan place cream and butter. Over a medium heat melt butter into the cream and then bring to the boil. Remove saucepan from the heat, set aside. Place sugar and water in another medium saucepan. Stir over a low heat until the sugar has dissolved into the water. Stop stirring and bring the mixture to the boil until the temperature reached 180°C (375°F) on a candy thermometer. The mixture should be a deep golden colour. Remove the saucepan from the heat and pour in the cream mixture. Stir to combine. Return pot to a low heat and cook, stirring for 3 – 5 minutes, until the caramel has thickened slightly. Remove caramel from the heat and leave to cool for 10 – 15 minutes. Once caramel has cooled, remove tart shell from the fridge and pour enough caramel in to fill the tart. Store any leftover caramel in a clean glass jar in the fridge. Place tart back in the fridge to set. Once set dust with cocoa and serve. 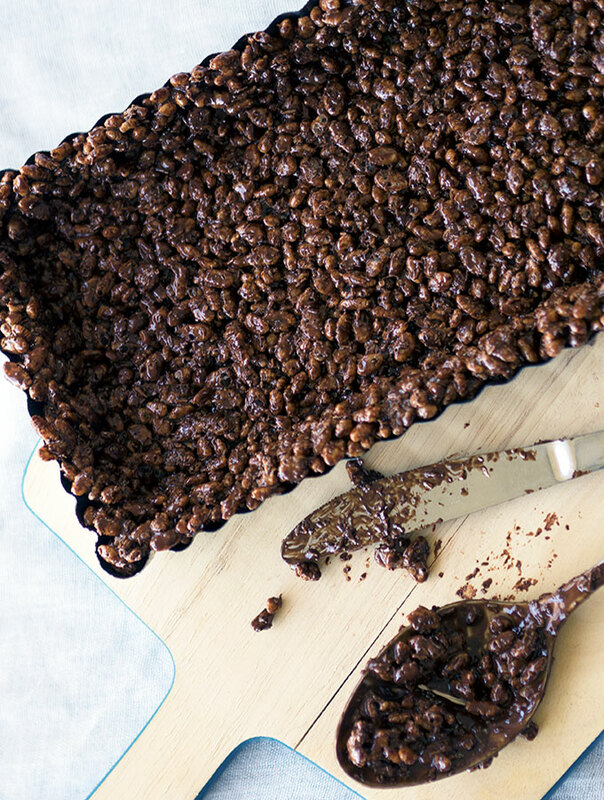 You had me at chocolate crackle! It’s the only reason I attend kids parties. lolol. About time it was incorporated into an ‘adult’ dessert. Strewth, Sara! Yep, chocolate crackles were always on the sweets table at birthday parties. And toffees! I always liked the chewy ones over the hard toffees. Will it be a disaster if you use ordinary refined sugar instead of castor sugar? Couldn’t find castor sugar last time I needed it. Ended up whizzing sugar up in the blender but then it turned into a powder, which actually worked incredibly well for meringue. And yes, I remember the parties with chocolate crackles, fairy bread, sausage rolls and party pies. But jelly orange slices were not a part of my childhood. The keyword here is “crack”, looks amazing. thank you for the recipe.